As the 4th title in the Gears series approaches, we are reminded of just how much gamers love the Chainsaw Bayonet. Gears of War fans won't get any love this holiday season - they'll just have to wait for the release of Gears of War: Judgement in March 2013 - but the series is still making headlines. Microsoft has revealed that the franchise just recently passed the 19 million sales mark. A pretty impressive figure, especially considering there are just three Gears of War titles available, and on just one console (technically, the first Gears title also appeared on PC, but you get the idea). 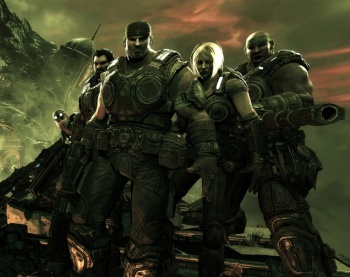 The first Gears of War title launched way back in 2006 and quickly became a hit. The sequel arrived two years later, and the third game was released just last year. The next title, Judgement, acts as a prequel of the first game and is the only title in the series not to feature Marcus Fenix as the main protagonist. Of course, while Gears is certainly a hit, its sales numbers pale in comparison to the older and more storied Halo franchise. According to recently updated sales info, Halo had moved over 46 million units even before the release of Halo 4. That's a lot of Master Chiefs.